The Border Policeman who neutralized the terrorist in Har Adar speaks. The Border Policeman who neutralized the terrorist who killed three in Har Adar recounted the actions that stopped the slaughter. On Tuesday, an Arab terrorist who attempted to enter Har Adar with a concealed pistol opened fire at security personnel during a security check at the entrance to the town, killing three and wounding one before he was shot and killed. "I got out of the jeep, I opened the car door and fired three bullets until the terrorist fell," recounted Border Police Sergeant First Class N., whose name cannot be revealed due to security reasons. 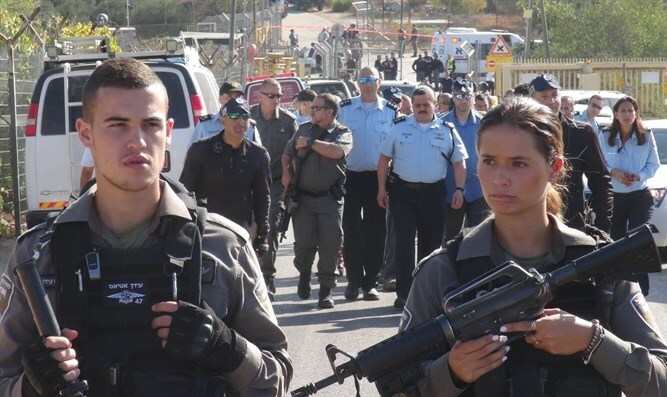 Police Commissioner Roni Alsheich told reporters soon after the attack that N.'s quick response prevented the terrorist from infiltrating Har Adar and committing a massacre. "This was a routine mission for them. The terrorist simply opened fire on them, and their quick response led to the terrorist's death," Alshiech said. "Had they not returned fire, he would have continued on his murderous mission." The attack was carried out by Nimer Mahmoud Ahmad Aljamal, a 37-year old laborer from the nearby village of Beit Surik, who possessed a work permit enabling him to enter Har Adar. Jamal had aroused the suspicions of the security coordinator there, and when he was asked to stop approaching the entrance, opened fire with a pistol, killing Border Policeman Solomon Gavriyah, 20, and security guards Youssef Ottman, 25, from Abu Ghosh and Or Arish, 25, from Har Adar. According to police, the weapon used in the attack was stolen back in 2003, and the Shin Bet security service said that Jamal did not have a record of being involved in terrorism or crime. Investigators probing that attack point to the terrorist's troubled family life and a history of domestic violence. According to a report by Kan, Aljamal’s wife left him several weeks ago, moving to Jordan and leaving Aljamal to care for the couple’s four children. He had worked in Har Adar as a cleaner for years and was well liked. Before Aljamal went on a murderous rampage at the entrance to Har Adar Tuesday, he penned a letter to his wife in which he called himself “a terrible husband” and alluded to his plans to carry out a terror attack on Israelis.